You'll be £15.99 closer to your next £10.00 credit when you purchase The Battle of the Somme 1916. What's this? Both Sides of the Wire is the first in a new series of battlefield guides that looks at the fighting on the Western Front, chiefly in the sectors in which the British Expeditionary Force was engaged. In these books, Nigel Cave and Jack Sheldon will look at engagements from both the allied and German perspective; at the end of each chapter there will be a tour section so that readers can place themselves in the best vantage points to follow the action that is described on the ground and which is directly related to the narrative account that will form the bulk of each chapter. 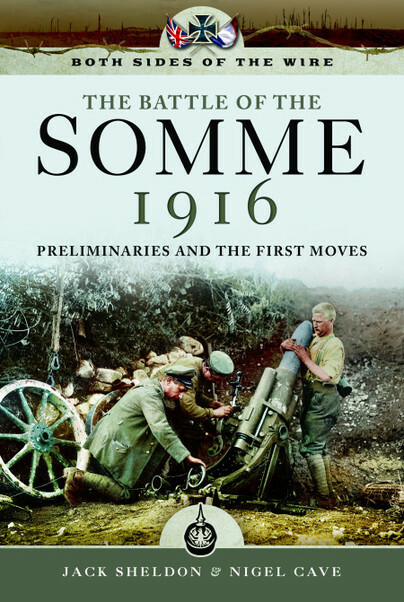 This book deals with the Somme up to and including the first day or two of the infantry assault on 1 July. In addition to the familiar British sector, the authors intend to cover those parts of the Somme battlefield that were (largely) fought over by the French. Although there is much to see of the ‘French’ Sector, it is generally poorly served by published guides despite the fact that there are numerous signs of the Great War of the ground, many accessible to the public. With the concentration on 1st July and the subsequent months, there is relatively little about what happened on the Somme from the establishment of the line there in October 1914 to the summer 1916 offensive. For example, this involved extensive mine warfare, of which very few traces remain, but for which there is excellent contemporary mapping and some useful accounts. Because of the considerable amount of literature already available on the British sector of the Somme, the authors will be concentrating on particular aspects - areas selected include: Gommecourt (56th London Division); Serre (the French attacks of June 1915); the Heidenkopf; raids prior to I July around Beaumont Hamel; the Schwaben Redoubt, the German defence plan and what happened on the day; the Glory Hole and the fighting there from December 1914; the area around King George’s Hill, near Fricourt; the attacks and counter attacks at Montauban on 1 - 3 July 1916; a very successful limited German assault at Feuilleres in January 1916; the line at Dompierre and Fey, in particular mine warfare (and also some coverage of the brief tenure of the line in this area by the British in the autumn of 1915). The book is aimed at anyone with an interest in the war, in the Somme in particular and, whilst acting as a guide, it will also be of value to those who cannot get to the Somme themselves, with the authors aiming at a more balanced understanding of what happened and explaining the outcomes at the various locations.